And after all the weather was ideal. Of course he knew—no man better—that he hadn't a ghost of a chance, he hadn't an earthly. Eleven o'clock. A knock at the door. Up, up they thrust into the light and heat, shouting, laughing, squealing, as though they were being pushed by something, far below, and by the sun, far ahead of them—drawn up into the full, bright, dazzling radiance to...what? 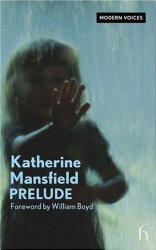 If you wonder how someone like Katherine Mansfield who published so little work could have such a wide influence on modern writing, spend some time with this collection. Reading The Garden Party and Other Stories is like perusing other writers' entire libraries. The variety of story types, styles and subjects is eye-opening. I particularly appreciate that the characters come from all walks of life—rather than from the affluent artistic, literary and intellectual crowds that are the only people who many authors of her time seem to know and write about. 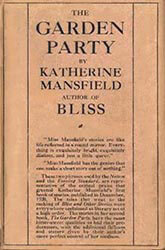 Most critics though focus more on the stylistic variety of these tales, the many ways Mansfield tells her characters' stories, the innovations she introduces or adapts from other writers. This is certainly valid. Even more impressive is how interesting these stories are. When you hear about "experimental" or "innovative" writing, don't you just cringe, expecting some technically brilliant but unreadable mass of prose? On the contrary, Mansfield's Garden Party stories are for the most part not only accessible to untutored readers but engrossing. I have to admit, I didn't get this immediately. The first and longest story in this collection, "At the Bay", is often praised as one of her ground-breaking best in the modernist, impressionistic style. Which is to say it wanders all over the place, never settling on one involving point of view, avoiding any single narrative thread and describing the life of people (a well-to-do New Zealand family on vacation at the beach, supposedly based on Mansfield's own upbringing) I couldn't identify with or care about. If you like Virginia Woolf's To the Lighthouse, you'll probably love it. 'Isn't life,' she stammered. 'Isn't life—' But what life was she couldn't explain. No matter. He quite understood. 'Isn't it, darling?' said Laurie. Okay, kind of precious. Melodramatic. But you see the beginning of a reaching out from a cocoon of privilege into the larger outside world of people who are nothing like the author as she was raised. In "The Daughters of the Late Colonel", two unmarried women seem to be devoted to the memory of their recently departed father who had been central in their lives. Mansfield's characters never say anything directly to contradict this, but over the course of the story the accumulation of details leads us deeper into their lives—and to a realization that the characters themselves may fear to recognize. These three stories take up half the collection, while eleven more comprise the rest. Sharp differences of style and content become more apparent. "Life of Ma Parker" contrasts the life of a charwoman in the context of the "literary gentleman's" house she takes care of and, heartbreakingly, within her own family. It is accomplished with just a few scenes and the memories of the main character. The last story in the book, "The Lady's Maid", gives the perspective of a similar character but this time the story is told entirely through the woman's spoken dialogue—we have to figure out the real story without access to the character's thoughts, by reading between the lines of what she says. "Miss Brill" takes us into the mind of a spinster attending an outdoor musical concert. The neatly ordered world she had created in her fantasies is demolished by an overheard comment from a disrespectful young person. In "The Singing Lesson" the music teacher leads a class through choir practice while inwardly lamenting her fiancé's betrayal—until she receives different news. In both stories we see only the main characters' points of view and in both stories their mental states are entwined with music. But yet they are very different characters, the rhythms of the stories are different, and we are affected differently. My favourite story is probably "The Stranger". It is reminiscent of Joyce's "The Dead" in Dubliners, in that a husband comes to realize his wife has had a passionate involvement with a man who is now dead. Unfaithfulness is first suspected but in the end a more profound estrangement is realized. These summaries of the stories do not do them justice. They might even turn off readers by making them sound dull or mundane. But they are far from boring. Mansfield's sharp writing, her flair for the vernacular, and most of all her understanding of people, makes these stories engage us both intellectually and emotionally.